Carrier picks up title for second time at 12th Asia's Best Employer Brand Awards 2017. Vietjet Air has been named Asia’s Best Employer Brand in 2017 thanks to its innovative solutions in recruitment as well as its effort in creating an internationally standardized, professional working environment for all employees. This is the second year the airline has received the honor. 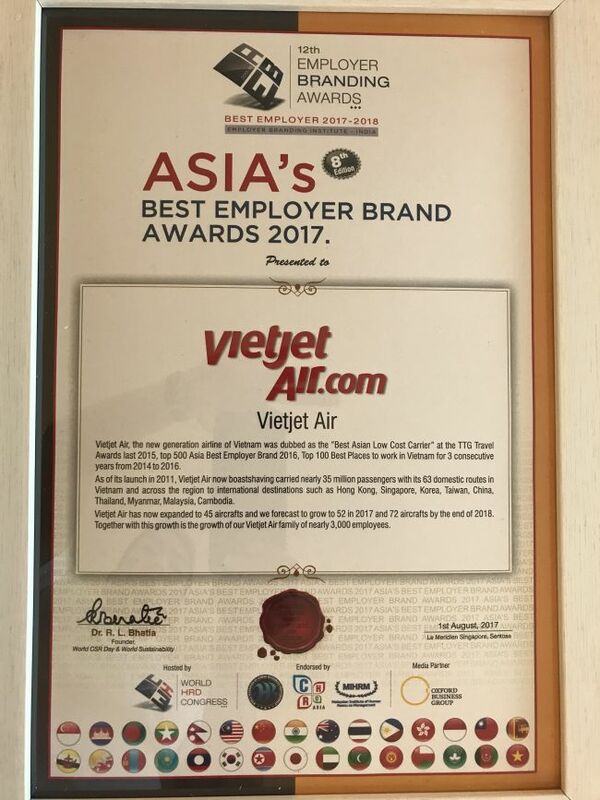 The 12th Asia’s Best Employer Brand Awards 2017 recognized Vietjet’s excellence in building the company brand as an employer of choice, with consistent improvements in its human resources (HR) policies introduced by measuring organizational health and inculcating values that help it achieve its vision and a culture of contribution and innovation at work and develop future leaders. Established in 2007, Vietjet now leads Vietnam’s domestic aviation market and is actively expanding its international flight network. After more than five years of operations, the carrier has become one of the most favored workplaces for foreigners from more than 40 countries and territories, who have made positive contributions to making air travel become a popular means of transport among passengers not only in Vietnam but also in regional markets. The airline has been honored with 32 domestic and ten international accolades, including being named “One of the Top 500 Brands in Asia 2016”, “Vietnam’s Most Favorite Airline”, and “The Best Asian Low Cost Carrier 2015” at the TTG Travel Awards 2015, among others. Vietjet is a member of the International Air Transport Association (IATA) and possesses the IATA Operational Safety Audit (IOSA) certificate. Its operational safety and technical reliability rates have continually been among the highest in the Asia-Pacific region, with a modern fleet and amazingly diverse and friendly services. The Employer Branding Institute, organizer of the awards, is a virtual organization. Senior leaders in HR connect with each other in cyberspace to share best practices in employer branding and it has outstanding professionals in several countries who are contributing to “talent management, talent development, and talent innovation”. The organization is exemplary in the manner in which it is run and has created a platform to celebrate the best in employer branding in several Asian countries. Its network is increasing in size and stature, with several HR leaders from 36 countries recommending individuals and organizations who are doing exemplary work.